Store Model Signature Sluggers. Top to Bottom: Yogi (Larry) Berra, George Brett, Roger Maris, Hank (Henry) Aaron, Richie Ashburn, Ken Griffey, Jr.
WPW’s bat historian, Rocky, sat down with Nathan Stalvey, Museum Curator at Louisville Slugger headquarters in Kentucky to get a feel for his experiences and his favorite pieces from baseball history (just about every baseball legend you know swung Slugger, so there are plenty to choose from). Enjoy this look back at baseball history, and we’ll have more from Louisville Slugger’s top guns this week. 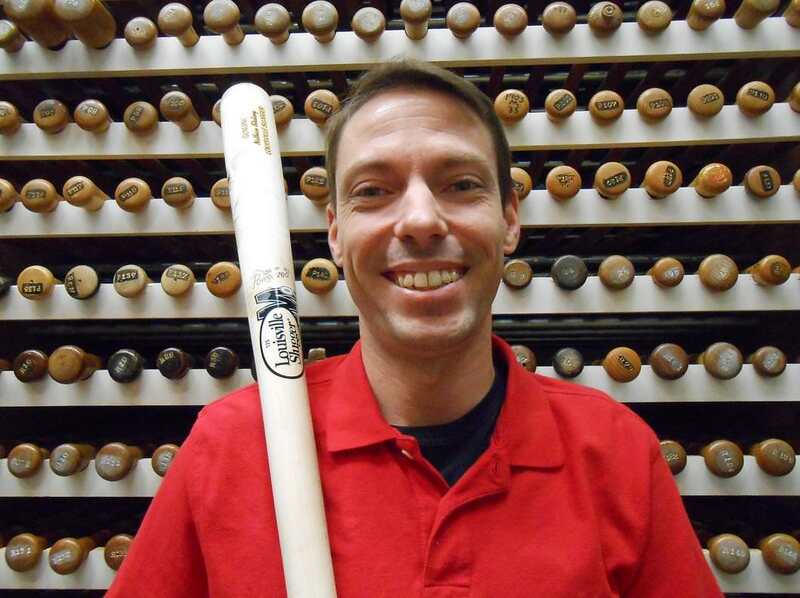 WPW: The Slugger Museum has been around for how long? WPW: So when you got there it was an established collection…is there a conscious effort to not be the Hall of Fame? NS: There is…while our mission isn’t to not be the Hall of Fame, we want to be another baseball museum that fans can go to. We work very well with them. We don’t want to take anything away from them, but we have a great museum here that celebrates Louisville Slugger’s role in baseball history, plus we have a factory. So the experience the fan is going to get here is going to be very different than in Cooperstown. WPW: I’ve never been to your museum, is there a section devoted to the international usage of your bat? NS: We focus more on Louisville Slugger’s extraordinary role in the history of baseball in the United States. We look at international players who have signed with us and used our bats, we even have a plaque near our signature wall with the Japanese and international players we have signed. We have bats in the bat vault that were made for international players. WPW: For the All-American (Girls) Baseball League, what models of bats were they using? NS: We did make the bats for them, but we didn’t make individual models for them, there would be K55s, S2s, M110s that they could choose. The league wasn’t around for very long. WPW: “…Here, let us show you his shelf.” What is the best piece in the museum? NS: There are really two answers. There is the crown jewel of the museum, everyone would agree on that, and then there is my personal favorite. WPW: What is the crown jewel? NS: Crown jewel, without a doubt is the Babe Ruth bat, from 1927, the year he hit 60, the first 21 were hit with that bat, and he notched it around the center logo (above). It is a G69, a Gehrig model. The handle cracked, and he sent it back to the factory with message, “I am doing pretty well with this, make me more.” Somebody at the factory was smart enough to think “we should probably hold on to this thing” and we have had it ever since. 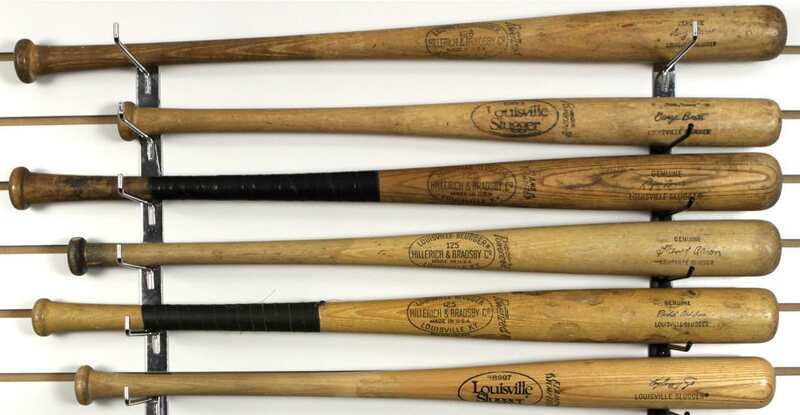 It is considered one of the most prized game used bats from Babe Ruth because of the notches and because of the story behind it. It has its own display area in the museum. 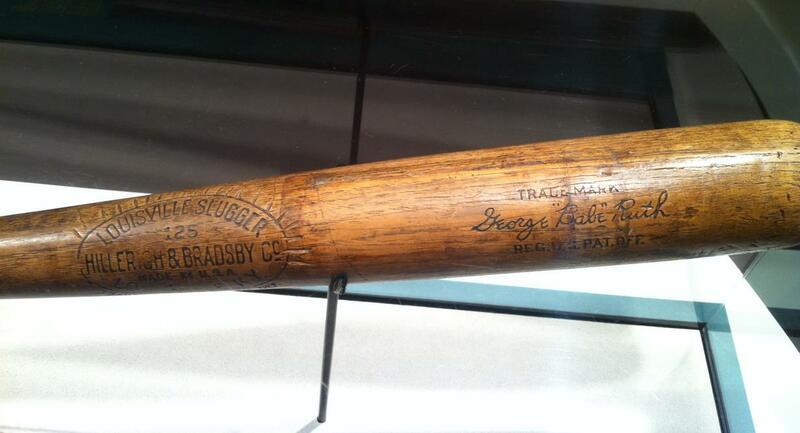 NS: Shoeless Joe Jackson’s barnstorming bat. WPW: What model is that? NS: A J13 model. It was his personal model. It is one of the thickest handled bats we ever made. He used it after he was kicked out of Major League Baseball in the early 20s, as he was barnstorming around the Southeast. He has always been one of the most interesting players to study, research and follow. He is also from my home state (South Carolina). WPW: What bat would you take to the plate for one at-bat? NS: I had looked at that question, and thought of two. There is a U1 Roberto Clemente bat. I have tried a million bats at the batting cage here, and that one I hit the best with. A close second is a bat that I made here myself. It is a 35 inch, 34 ounce maple bat with a U1 knob and a larger barrel. It is a little heavy…I should have made it an ounce lighter, but if I had one bat I would use that if the U1 wasn’t available. 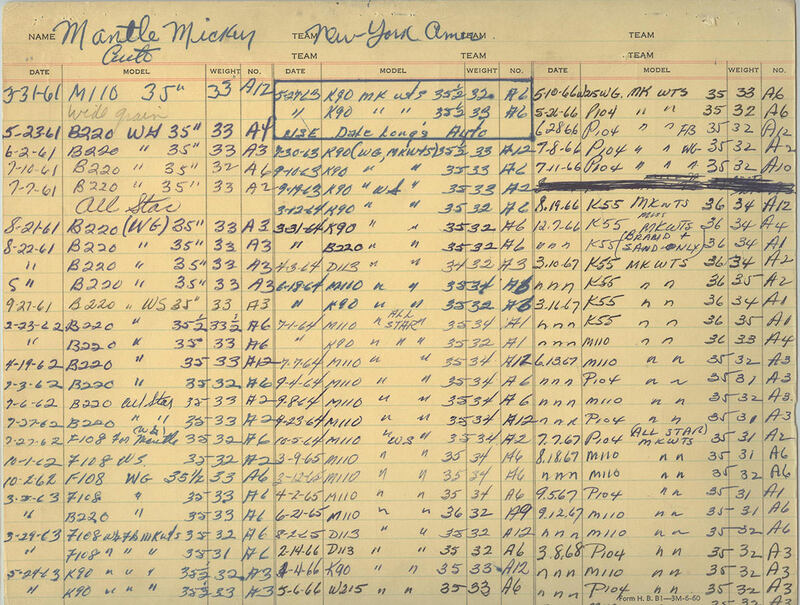 WPW: Do you get a lot of players visiting the museum? NS: Not as many as we used to. We get some, David Wright has been here, Jeter, Hanley Ramirez, Joe Girardi with his son back in 2009, Cal Ripken was here, and we have the Living Legends awards…so we have had our fair share. WPW: Who was your favorite? Favorite ball player, it was a guy named Ty Cline. He played in the 50s and 60s, and you wouldn’t recognize him on the street. We get a lot of players who were never in the Hall of Fame, maybe got one at-bat…but they signed a contract with us, and for them, this is their Hall of Fame. 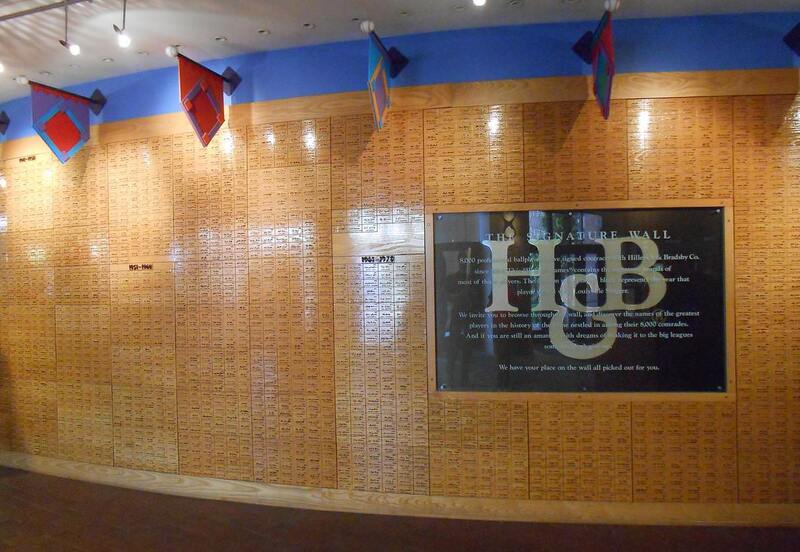 So when they walk in, and they see the signature wall, and they see their name, it’s quite moving. They usually bring their families…if we get a heads up we will roll out the carpet, we will show them their bat contract, we will take them to the bat vault and show them the models they used and we will see these grown men, and they are like school boys again. They feel like they are back on their first day of baseball. Ty Cline was special because he was from South Carolina, so he brought his whole family. He is in his 60s, almost 70s now, and we took him to the bat vault, where he and his family got to hold the model bats that he used. We had made five different models for him, each with his signature on them. The whole family was misty eyed. They were just so gracious. Baseball had never worked as a career for many players, but they had the chance, and they get to come back here to enjoy it. They get to share it with the families who heard the stories, but here they can see the contracts and see the bats. It is just fabulous. WPW: That must be an incredible feeling to create that experience for guys like him. Are there any events coming up soon at the museum? NS: Cal Ripken is going to be our Living Legend this year (November 8th), and on top of that, we work with Hunt Auctions for an annual auction. In November they will be doing appraisals for free and people will able to walk around and see the items that will be up for auction on that Saturday. Also, Bill Mazeroski is going to be here. He is auctioning off the bat, jersey, cleats and glove that he used in the 1960 World Series.